318, 383 both non-fluor [1950 10 øre green Wavy-Lines Engraved; 1961 20 øre brown Frederik IX] (VF, dam. corner) on 5 February 1962 cover, with Superb "TERKELSBOL pr. TINGLEV" crown and posthorn cancel #159.5 (Type IIId) in blue on the stamps, and dated "FREDERICIA-PADBORG" RAILWAY side cancel. This c/p cancel is very scarce, valued at DKR 950 in 2006! 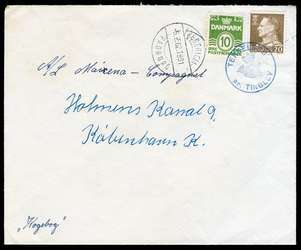 Denmark #318 and 383, both non-fluor [1950 10 øre green Wavy-Line / Numeral; 1961 20 øre brown Frederik IX] (VF) on 17 January 1962 cover from "NOLSØ pr. 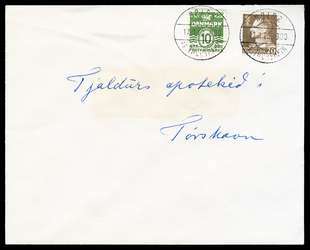 THORSHAVN" (Daka postmark #25.03) with VF+ postmarks. Commercial mail to the pharmacy; small darkened area due to storage next to another envelope. This is a scarcer postmark; use of this postmark ceased on 31 May of that year.